I am attempting to play a fairly high-gain music with traditional-output single coils, so I am always on the lookout for a quality high-gain pedal. 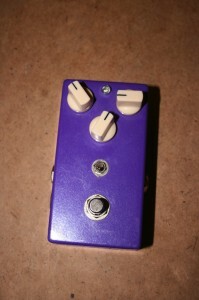 And Love Kraft Chupacabra was my go-to pedal for almost a year. The left knob is the gain, the right knob is the volume, and the center is tone. The 3-way switch selects clipping options. The switch in top and bottom mode, are virtually indistinguishable — perhaps the bottom is a hair smoother? But the middle bypasses clipping and it gets very loud with less gain. The pedal can do a “pushed clean” sound surprisingly well in this mode, with gain set low. It doesn’t really go over to actual “low gain” arena in this mode though — at higher gain it feels rather unnatural. Now, either in top or bottom mode, it can some low gain sounds fairly well — at least better than other pedals with this much gain on tap that I’ve tried. It cleans up well with volume knob. But turning up the gain, it gets intense pretty quick. This is a very thick distortion. I’m no Rat fanatic — in fact, I wasn’t really looking for a “Rat” tone when I got it — I was more looking for a smooth high gain pedal. I wouldn’t call it “smooth,” however. It still is pretty hairy and with very forward-sounding mids that are in your face. The higher the gain, the thicker it gets, so you end up turning up the tone to compensate, which has less effect at higher gain settings. So at the higher gain settings, you end up surrendering to this pedal’s voice and your guitar is more of a trigger. But it has enough gain to coax some blistering lead tone out of weak single coils. It’s too thick for rhythm work but it’s awesome for single-note leads. Well, there are many Rat-based pedals out there, so I can’t say what’s better or best. But Chupacabra is great if you’re looking for a modern, in-your-face high gain pedal. It’s got enough range not to be a one-trick pony, but it’s not so versatile that you don’t know what to do with it. And at $139 new, it’s a great value.